A leading outfitter of non-comformity flyfishing apparel & accessories. For more than 40 years it has been our direction to design and create new products for our fly fishing industry. We are committed to produce and offer the highest quality fly fishing equipment in our industry. 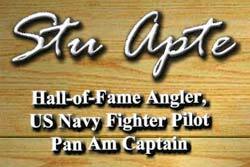 Customer service has always been our top priority with our mission and dedication to offer complete satisfaction to our valued supporters of Jim Teeny, Inc.
Stu Apte, Hall of Fame Angler, author, television personality and inventor of the Stu Apte Tarpon fly. Rare Out-of-Print Books for the Angler, Fly Tyer, and Collector. If you’re a woman who loves fly fishing, come join us! Guy Tillotson’s Grand Slam Group is one of the nation’s top manufacturer’s reps to the outdoor industry. Our clients represent many of the best brands in the fishing, fly fishing, and outdoor industry. The Bear’s Den maintains one of the largest selection of fly-fishing, tying and rod building products in New England. The Bear’s Den holds in-store fly tying and rod building classes and provides fly casting instruction. There is always something new happening at The Bear’s Den. Book a trip and have one of the best guided fishing adventures in the world. Tackle and Supply. Fish the Legend. Located in The Dalles, OR., Owner Paul Anderson provides flyfishing anglers with high quality products and services.